This is an updated version of a post originally published on October 26th 2012. 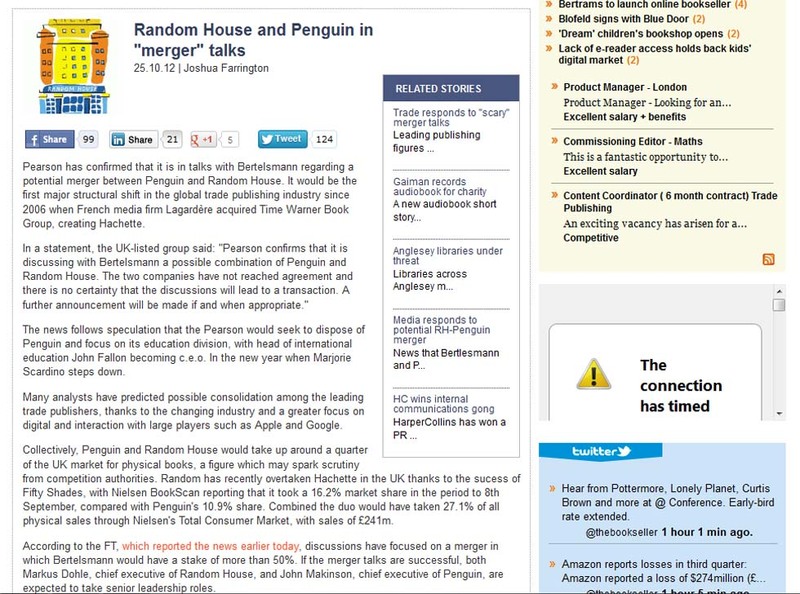 Since I shared the mass media’s coverage of the merger talks between Penguin and Random House three days ago (provided in full below), the deal has been confirmed. 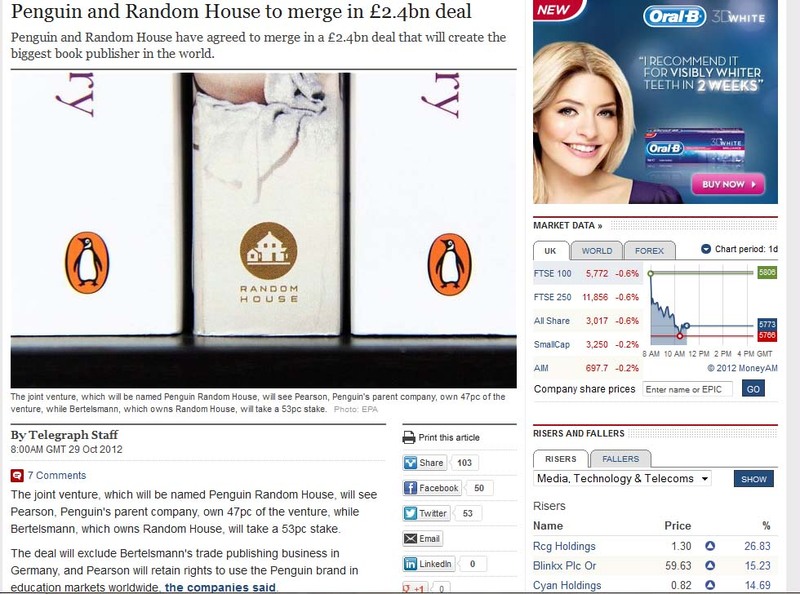 As the story has moved on so have some of the media, with at least two mainstream newspapers now featuring Random House in their supporting images. 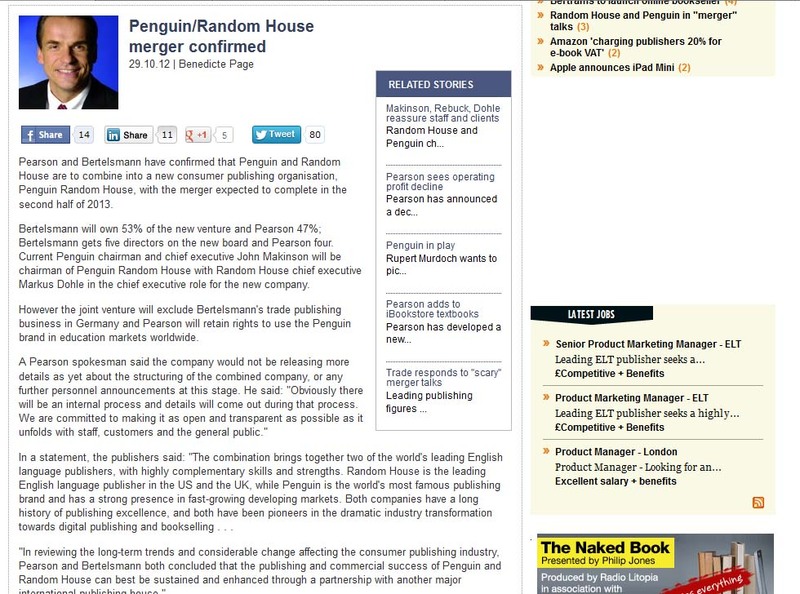 The name of the new company, Penguin Random House, however, reiterates the power of the Penguin brand. How often would a smaller company get top billing? Images of the latest coverage are included at the bottom of last week’s post. ORIGINAL POST 26th October 2012. 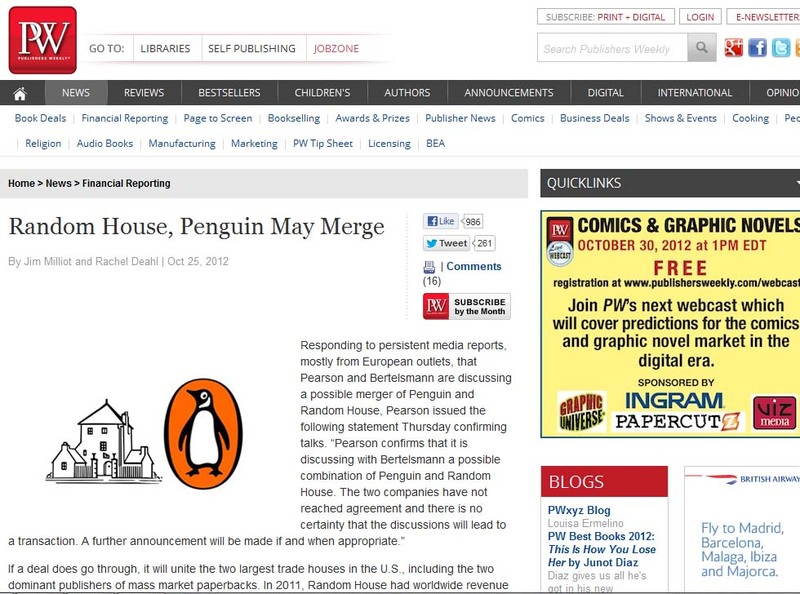 The publishing world is abuzz today with talk of the potential merger between Penguin and Random House. 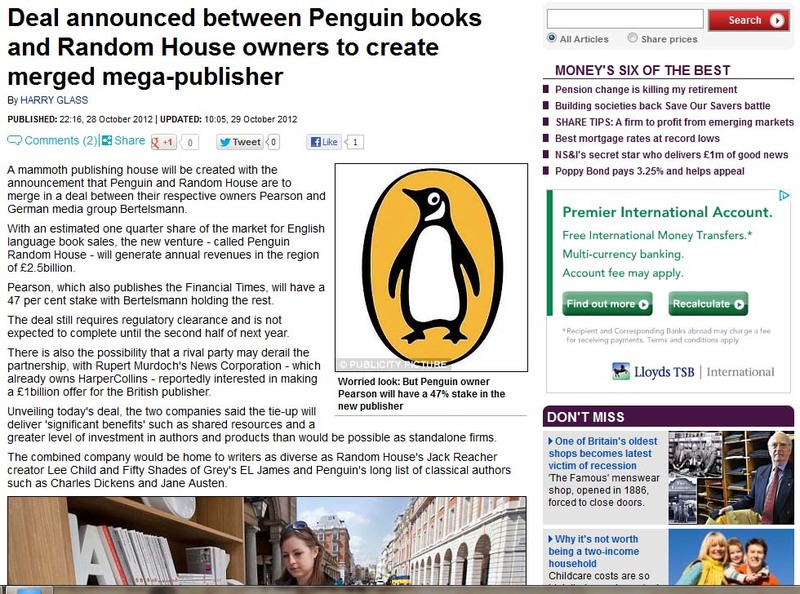 The possible creation of “the world’s largest book publisher” story was picked up by much of the mainstream media, who almost exclusively chose to illustrate their reports with images of Penguin’s brand. 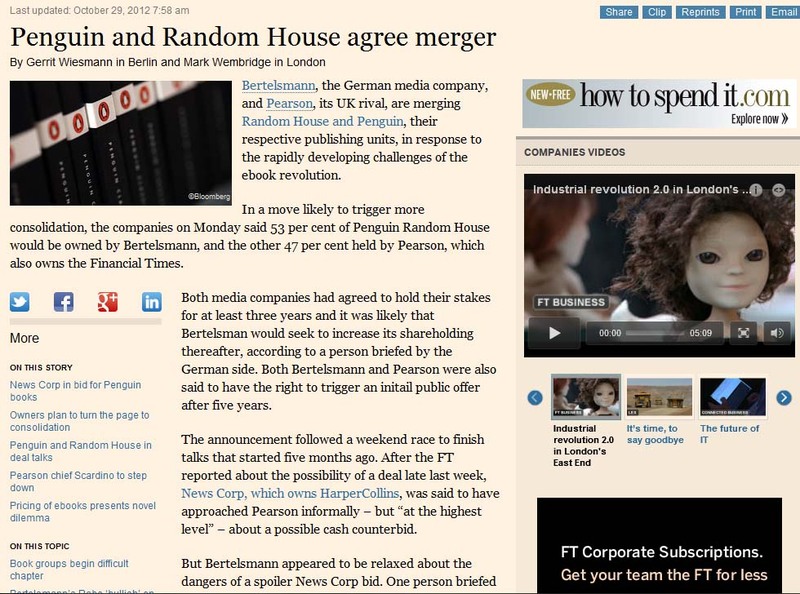 Given that Random House have the larger revenues – and their owners are said to be taking a larger stake in the mooted partnership – is this a measure of the strength of Penguin’s brand, laziness on the part of picture editors, or a sign of jingoism against Random House’s German parent Bertelsmann? Despite highlighting Penguin’s Jame Oliver and Random House’s Fifty Shades of Grey author EL James within the article, the Guardian roll out an image of battered Penguin paperbacks. The Telegraph also plump for a weathered selection of Penguin spines. The BBC go for a more modern close-up of a Penguin spine. 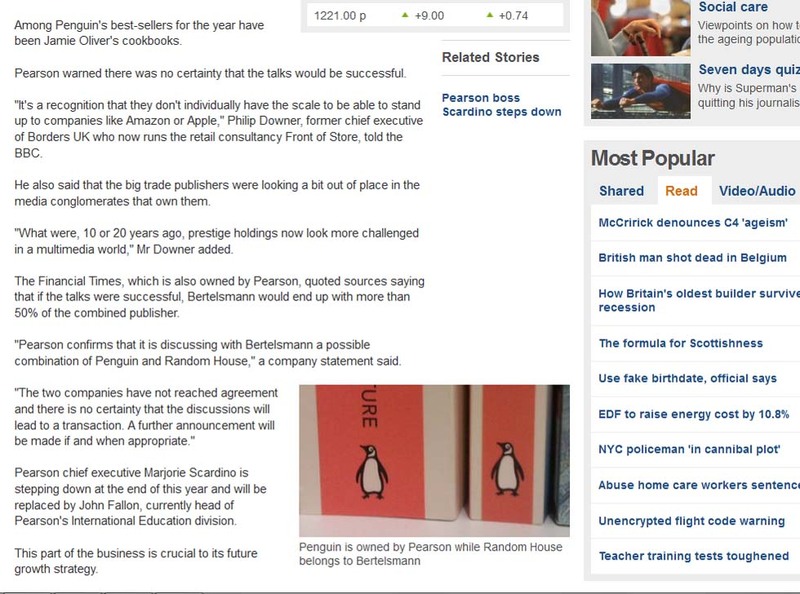 The FT (owned by Penguin’s parent Pearson) also give space to a modern series, the Penguin Popular classics. 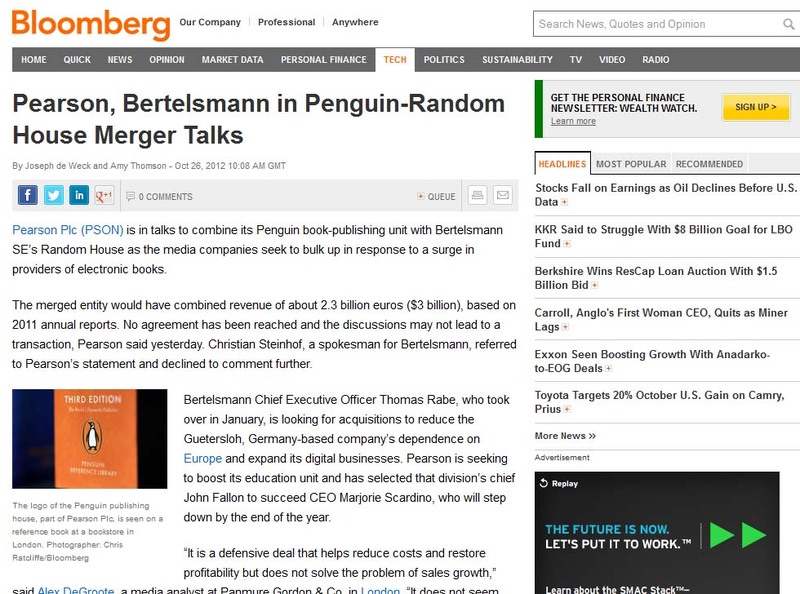 Bloomberg zoom in on the Penguin Reference Library. 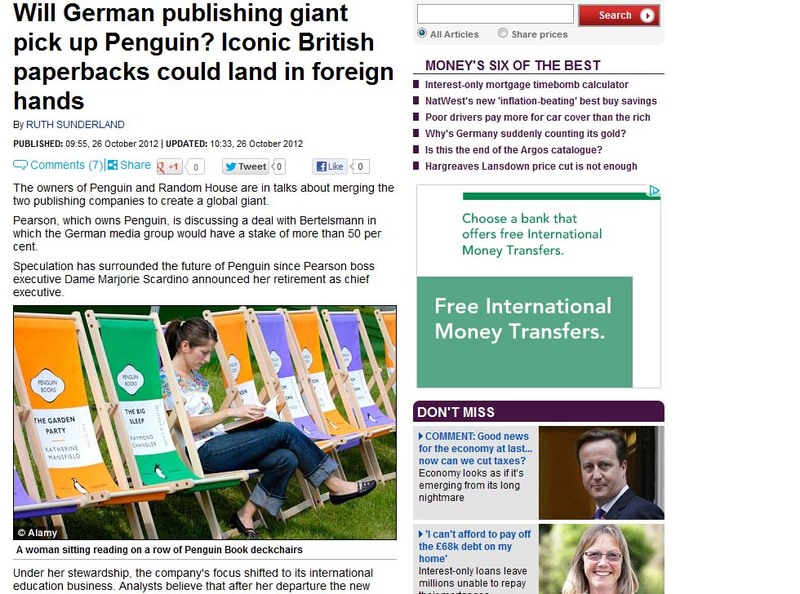 The Daily Mail emphasise the German threat to our Penguin-branded deckchair lifestyle. 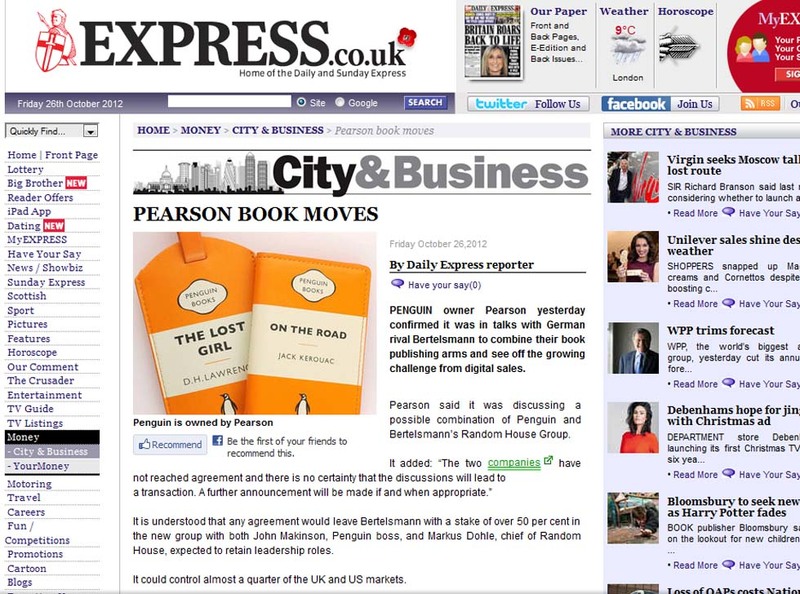 The Daily Express also feature nostalgic Penguin-branded gift products. 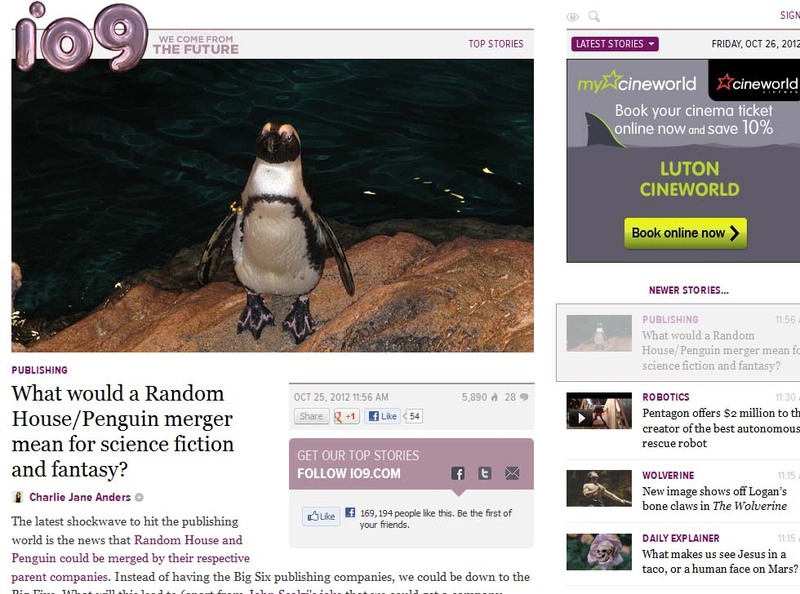 io9, ‘a daily publication that covers science, science fiction, and the future’ illustrate their feature with ‘a random penguin’. 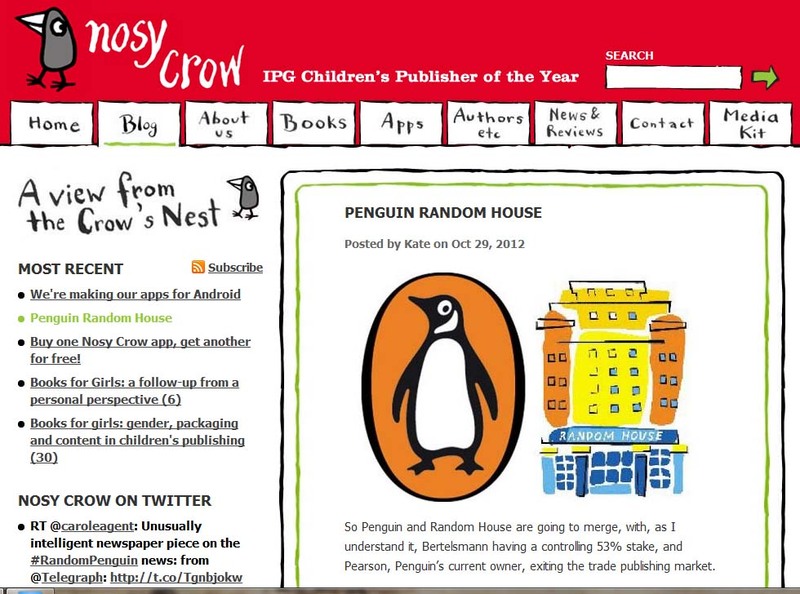 The trade publication Publishers Weekly buck the trend with illustrations of both brands. 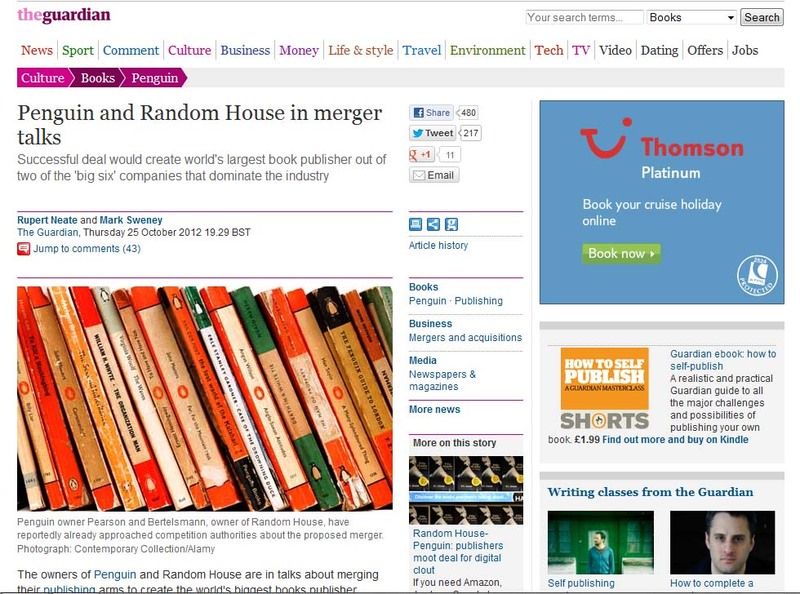 The Bookseller go a step further, showing only the Random House logo. 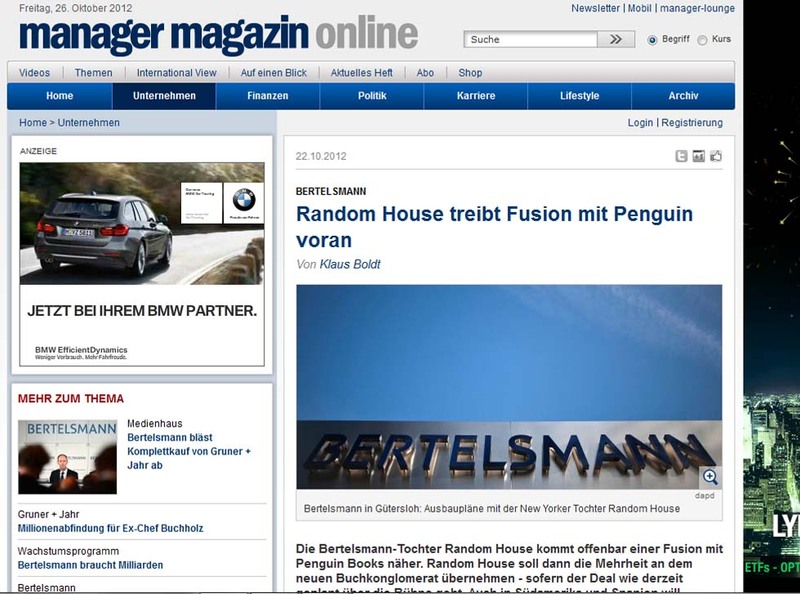 Unsurprisingly the German publication where the story first broke illustrate their story with the name of Random House’s German owner, Bertelsmann. UPDATED 29th October 2012. The following images are taken from press stories confirming the merger. 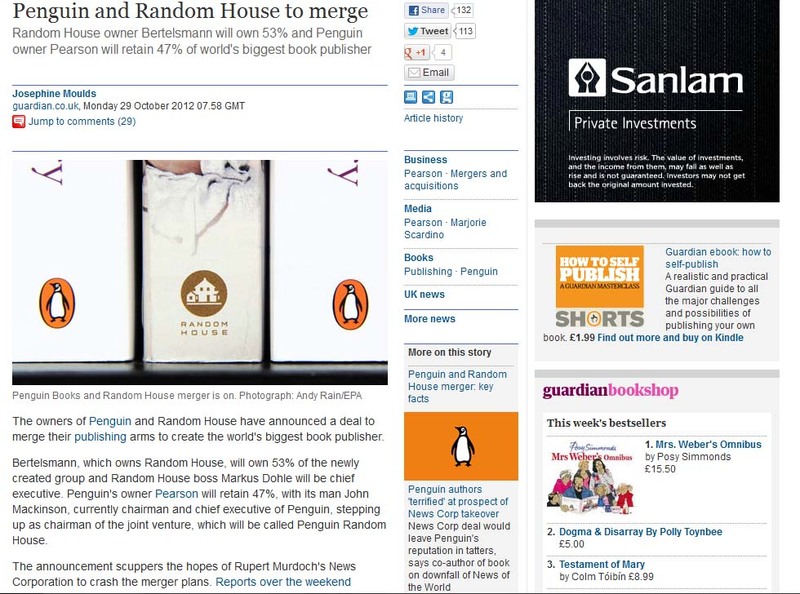 The Guardian now include a Random House book sandwiched between two Penguin titles. The Telegraph use the same interloper image. The BBC stick with Penguin, but leave behind their modern books in favour of an historic literary classic. 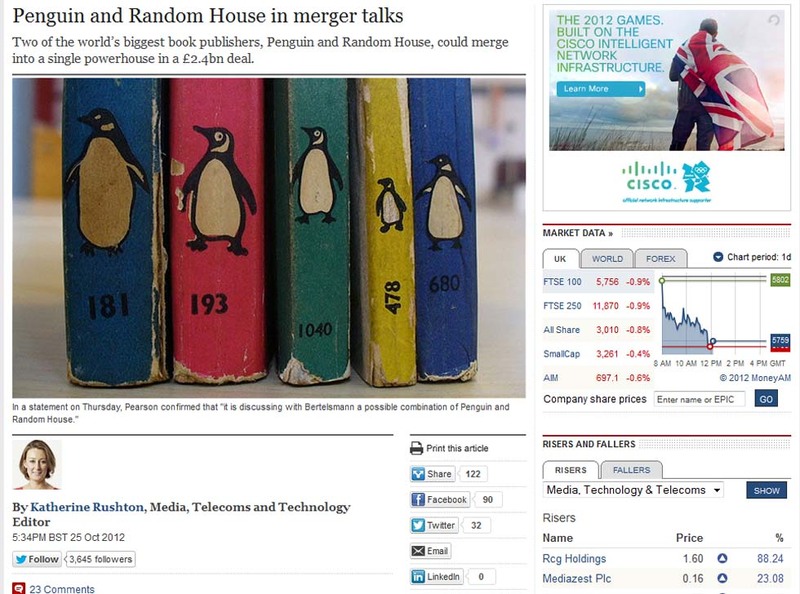 The FT also go retro, using the original Penguin classics rather than their contemporary reincarnation. As ever, the trade press take an alternative approach. The Bookseller features a portrait of Markus Dohle, chief executive of Random House. Industry blogger – and Kingston Masterclass speaker – Kate Wilson gives the brands equal visual space. I’d say that in the UK at least the Penguin brand is MUCH stronger and has a longer history, hence the predominance of old Penguin books in the press illustrations. Hi Revsimmy, thanks for the comment. I agree that the Penguin brand is stronger in consumers’ eyes. 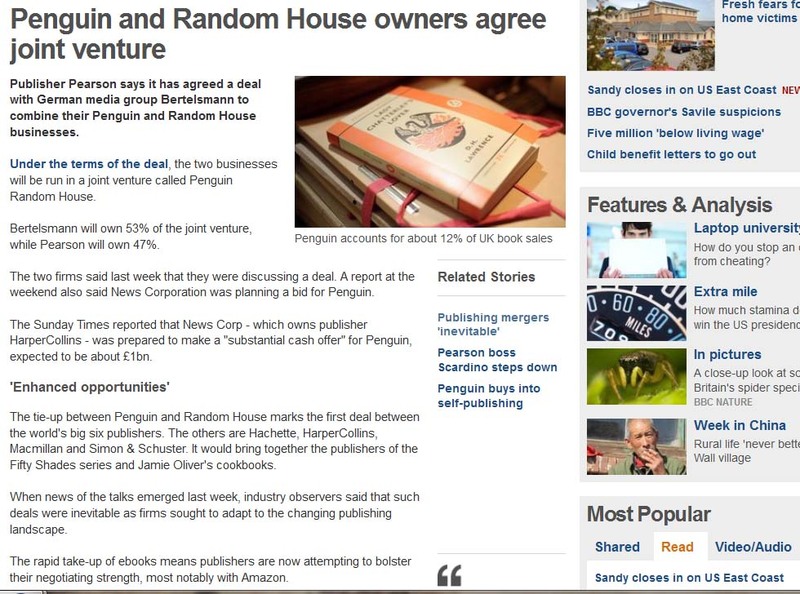 However, by choosing to use images of the Penguin brand to illustrate their stories you could argue that the media are building on the public’s likely misconception about the relevant size of the companies (because of the brand strength people probably also consider Penguin to be the stronger company. 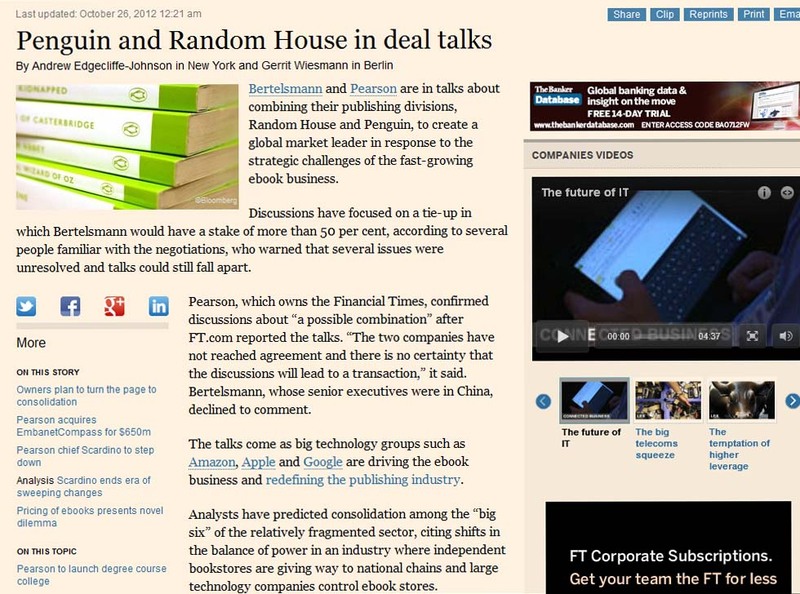 In fact Random House are the bigger player). That’s why I included the stories from the trade and business press, who chose to use different images, giving a more balanced visual view of the story.